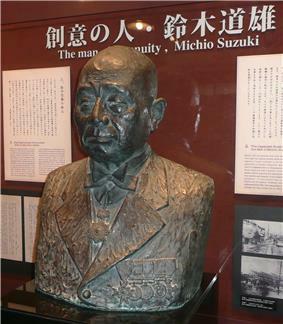 Suzuki is a member of the Mitsubishi UFJ Financial Group (MUFJ) keiretsu. 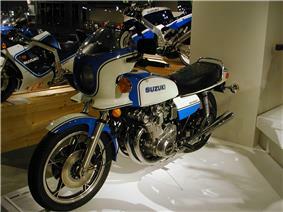 Faced with this colossal challenge, Suzuki's returned to the production of motor vehicles. After the war, the Japanese had a great need for affordable, reliable personal transportation. A number of firms began offering "clip-on" gas-powered engines that could be attached to the typical bicycle. 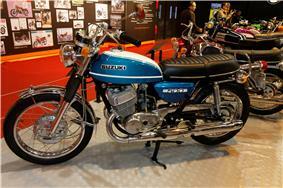 Suzuki's first two-wheeled vehicle was a bicycle fitted with a motor called, the "Power Free." Designed to be inexpensive and simple to build and maintain, the 1952 Power Free had a 36 cc, one horsepower, two-stroke engine. The new double-sprocket gear system enabled the rider to either pedal with the engine assisting, pedal without engine assist, or simply disconnect the pedals and run on engine power alone. The patent office of the new democratic government granted Suzuki a financial subsidy to continue research in motorcycle engineering. Volkswagen AG completed the purchase of 19.9% of Suzuki Motor Corporation's issued shares on 15 January 2010, Volkswagen AG is the biggest shareholder in Suzuki. Assembly outside of Japan commences for the first time, in Pakistan. Assembly kits of the ST90 Carry and LJ80 (Jimny) are shipped, both with 800 cc engines. Production and sales were done by two local entities (Sind Engineering and Naya Dauer Motor) under the auspices of PACO (Pakistan Automobile Corporation). Masaru Mizutani (Japanese) on his RG Γ takes first place in seven consecutive events and wins the All Japan Road Race Championship for the 500cc class. 1995: Aggregate sales of Suzuki minivehicles in Japan reach 10 million units, aggregate motorcycle exports rom Japan reached 20 million units. SMAC opens Suzuki's only U.S. manufacturing facility in Eiger series of ATVs. Its plant in Yangon, Burma was closed after the joint venture with the government between 1998 and 2010 had expired. 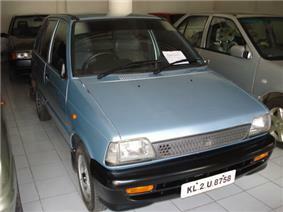 On 14 February 2011, Maruti announced that it had achieved one million total accumulated production volume of the Alto. The Alto has reached the million units mark in just seven years and five months since its launch on September 2000. The last half of the million was achieved in 25 months. The Alto became the third car by Maruti Suzuki stable to cross the million units mark, following the Maruti 800 and the Omni. In January 2012 at the New Delhi Auto Expo, Maruti presented a new car called the Maruti Suzuki XA Alpha, to commence production in mid-late 2013. In 1995, American Suzuki introduced the Esteem and redesigned the Swift. The Swift GT was dropped and this version Swift was specific only to North America where it was built at CAMI. These models were the first Suzuki vehicles to be marketed in North America with dual front airbags. A station wagon version of the Esteem was introduced in 1996. Worldwide Suzuki production reached more than 975,000 cars this year. Also in 1996, American Suzuki released the 2-door SUV X-90 and a revised Sidekick Sport model with dual airbags, a 120 hp (89 kW) 1.8 liter engine, 16 inch wheels and two-tone paint. 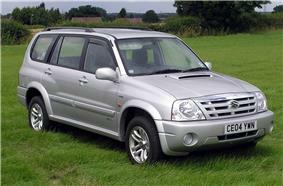 The Sidekick was replaced by the Vitara and the Grand Vitara for 1999. The Grand Vitara would be Suzuki's first model with a V6-cylinder engine and available 4-wheel ABS brakes. The Grand Vitara XL-7 was introduced in 2001 as a stretched version of the Grand Vitara. The Grand Vitara XL-7 had a larger 2.7 liter V6-cylinder engine and 3-row seating. This would be Suzuki's largest vehicle to date. G70 appeared at the 2011 Tokyo Motor Show as the Regina, but was renamed before the 2012 Salon International de l'Auto and Auto China shows to signify that it met the goal of carbon dioxide (CO2) emissions no higher than 70g/km (and perhaps that Regina as a model name would be a marketing fiasco). The G70 is a concept for the next-generation global compact car, possibly replacing the Alto, and at 3,550 millimetres (140 in) long and 1,630 mm (64 in) wide with a weight of 730 kilograms (1,610 lb), the G70 is smaller and lighter than the Alto. It has an extremely economical 800 cubic centimetres (49 cu in), direct-injection turbo gasoline engine mated to a continuously variable transmission, and a claimed fuel mileage of 3.1 litres per 100 kilometres (91 mpg-imp; 76 mpg-US). Suzuki showcased the 4x4 mini SUV concept iM-4 concept at the Geneva Motor Show in 2015. The sub-4 metre SUV is likely to enter the production in 2016. Suzuki hired Degner, and he won the 50 cc class F.I.M. road racing World Championship for them in the 1962 season. Suzuki became the first Japanese manufacturer to win a motocross world championship when Joel Robert won the 1970 250 cc title. In the 1970s, Suzuki established themselves in the motorcycle racing world with Barry Sheene and Roger De Coster winning world championships in the premier 500 cc division in road racing and motocross respectively. Suzuki continued to compete in MotoGP and last won the title in the 2000 season. Since 2006, the team was sponsored by Rizla and was known as Rizla Suzuki MotoGP team. On 18 November 2011, Suzuki announced that the GP racing was suspended, partly due to natural disasters and recession, until 2014. GT750 Le Mans with a straight-three engine was the first Japanese motorcycle with a liquid-cooled engine, earning it the moniker "Water Buffalo." The Society of Automotive Engineers of Japan (Japanese) includes the 1971 Suzuki GT750 as one of their 240 Landmarks of Japanese Automotive Technology. Katana – The GSX1100S was released in Europe in 1980; the GSX1000S arrived in the U.S. and Canada later that year as a 1981 model, and revolutionized sportbike styling. A 1982 Katana GS1000SV is on the AMA Motorcycle Hall of Fame‍ '​s list of "classic bikes" that have been shown in the museum, and was in The Art of the Motorcycle exhibition. GSX-R750 was one of the Japanese sport bikes of the 1980s that began the modern race replica era. It had air/oil cooling, light weight, and a powerful engine. The Society of Automotive Engineers of Japan (Japanese) includes the 1984 Suzuki GSX-R750 as one of their 240 Landmarks of Japanese Automotive Technology, and was in The Art of the Motorcycle. The DR-BIG aka Desert Express DR800S (German) off-roader was existent for two model years as the DR750S (German) until 1990, when its displacement increased to 779cc, still the world largest single cylinder engine in a production motorcycle. Available in Europe through 1999, it was not exported to the U.S. market. Replaced by the V-Strom twin, the DR-BIG has now come full circle as the design inspiration for a 2014 overhaul of the V-Strom 1000 ABS. SV650 was introduced in 1999 as a budget entry in the naked bike market and, and since 2001, offered both naked and fully faired. In 2009 the naked bike version was redesigned and renamed the Gladius in keeping with the sword motif Suzuki established with the Katana. 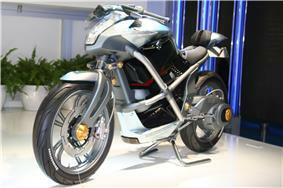 The Gladius motorcycle won a Good Design Award (aka G Mark) from the Japan Institute of Design Promotion. Suzuki is a major sponsor of luge, biathlon, and cross country skiing sporting events. They also the current title sponsor of ASEAN Football Championship, and English league club MK Dons. ^ a b "Suzuki Motor Corporation". ^ "Outline". Global Suzuki. Suzuki Motor Corporation. Retrieved 22 August 2013. ^ Suzuki is pronounced in Japanese, with a high tone on the last syllable [ki], followed by a downstep. It is pronounced in English, with a stressed zu. This pronunciation is used by the Suzuki company in marketing campaigns directed towards English-speakers. ^ a b "Twist the Throttle: Suzuki" (Video). Discovery Channel. Discovery Communications, LLC. Retrieved 23 August 2013. ^ Seth, Radhika (19 September 2012). "Adult adoptions makes perfect business sense". ^ a b c d "Products History 1950s". Motorcycle – Global Suzuki. Suzuki Motor Corporation. Retrieved 18 August 2013. ^ "Suzulight SS". 240 Landmarks of Japanese Automotive Technology. Society of Automotive Engineers of Japan, Inc. Retrieved 12 September 2013. This was Japan's first proper 4-wheeled minicar. It was released in October 1955 with a 2-stroke, 360 cc engine. The 'Suzu' of the name was an abbreviation of its manufacturer, Suzuki, and 'light' indicated both the nimble operation of the car and evoked an image of illumination. The Suzulight was the first Japanese vehicle to successfully mount a 2-stroke engine in a 4-wheeled car, and it was also the first wholly Japanese vehicle to use a front-engine front-wheel drive set up. ^ a b Mizukawa, Yuki (2012). 二輪自動車産業における寡占体制形成 [Oligopolistic structure formation in the motorcycle industry]. Economic Bulletin of Senshu University (in Japanese) (Tokyo, Japan) 47 (1): 75. ^ a b "Toyokawa Plant". Global Suzuki. Suzuki Motor Corporation. Retrieved 5 September 2013. 1–2, Utari, Shiratori-cho, Toyokawa-shi, Aichi. ^ a b c "Racing History 1960s". Motorcycles – Global Suzuki. Suzuki Motor Corporation. Retrieved 19 August 2013. ^ "Suzuki Fronte 800". 240 Landmarks of Japanese Automotive Technology. Society of Automotive Engineers of Japan, Inc. Retrieved 12 September 2013. Frontes were exhibited at the Tokyo Motor Show from 1962 to 1964, and the 800 cc class small passenger vehicle that was shown as an R & D vehicle was eventually released as the Fronte 800 in 1965. It featured a water-cooled 2-stroke 785 cc power plant and a front-engine front-wheel drive set up mated to a 4-speed transmission that propelled the car to a top speed of 115 km/h. Its styling was ahead of its time, which assured its favorable reception. ^ a b "Products History 1960s". 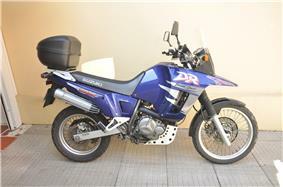 Motorcycle – Global Suzuki. Suzuki Motor Corporation. Retrieved 18 August 2013. ^ a b "Suzuki GT750". 240 Landmarks of Japanese Automotive Technology. Society of Automotive Engineers of Japan, Inc. Retrieved 12 September 2013. This motorcycle had a water-cooled, 2-stroke, 3-cylinder engine that provided good acceleration over a wide speed range from low to high. Technologies developed for Grand Prix racing were incorporated into the body structure and brakes. Easily visible meters and other features were also provided. ^ a b c d e f "Products History 1970s". Motorcycle – Global Suzuki. Suzuki Motor Corporation. Retrieved 18 August 2013. ^ "Racing History 1970s MX". 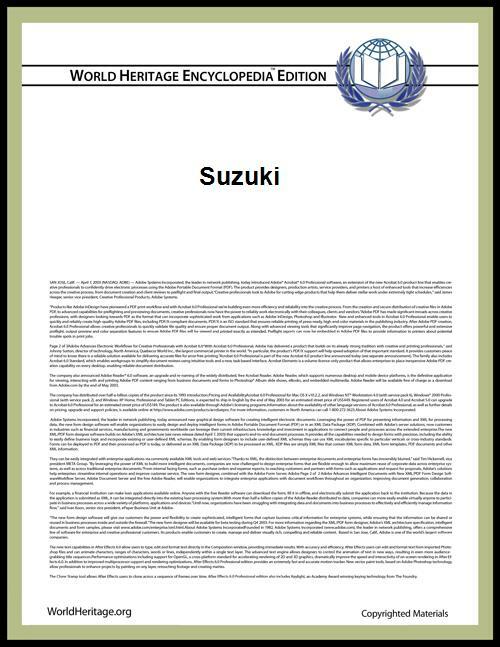 Motorcycles – Global Suzuki. Suzuki Motor Corporation. Retrieved 19 August 2013. ^ a b "Suzuki RE-5". 240 Landmarks of Japanese Automotive Technology. Society of Automotive Engineers of Japan, Inc. Retrieved 12 September 2013. This masterpiece of ambition was equipped with a water-cooled, single-rotor Wankel rotary engine. The RE-5 gained popularity all over the world for its completely unique design by Giorgetto Giugiaro, as well as its peripheral port system and twin mufflers. ^ a b c "Company Milestones". Pak Suzuki Motor Co. Ltd. Retrieved 14 September 2013. ^ a b "Suzuki considers turning out vehicles in Pakistan". ^ a b "Endurance and Superbike Racing History". Global Suzuki. Suzuki Motor Corporation. Retrieved 26 August 2013. ^ "GM ties with two Japanese car makers". ^ "Suzuki's New Australian Home". AutoWeb News. 1 March 1998. Retrieved 2 September 2013. Marking a new beginning for the giant Japanese car, motorcycle and marine manufacturer in Australia, the new purpose-built complex will be in Melbourne rather than Sydney, the company's home for 18 years. ^ a b c d e "Products History 1980s". Global Suzuki. Suzuki Motor Corporation. Retrieved 2 September 2013. 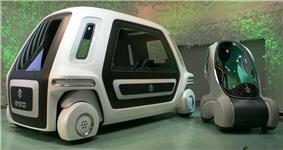 ^ "G.M., SUZUKI AND ISUZU AGREE TO 'MINI-CAR' DEAL". New York Times. 13 August 1981. Retrieved 2 September 2013. The companies hope to gain an edge in the increasingly competive [sic] market for small, fuel-efficient cars with an engine displacement of 1,000 cubic centimeters and under. The agreement provides for each of the three companies to acquire shares in the other companies and to offer mutual technological and marketing assistance. ^ a b "Racing History 1980s". Motorcycles – Global Suzuki. Suzuki Motor Corporation. Retrieved 19 August 2013. ^ "World Championship Motocross Racing/All Japan Road Race & Motocross History 1980s". Motorcycles – Global Suzuki. Suzuki Motor Corporation. Retrieved 19 August 2013. ^ "Suzuki to double auto production in Pakistan". ^ a b "Suzuki RG250 Gamma". 240 Landmarks of Japanese Automotive Technology. Society of Automotive Engineers of Japan, Inc. Retrieved 12 September 2013. The Suzuki RG250G was the dream machine of road bikes, developed using technologies that Suzuki had accumulated on the Grand Prix racing circuit. Every imaginable technology was packed into the machine, including the first aluminum square-pipe frame in the world to be used on a mass-market motorcycle. ^ AP (3 April 1984). "Suzuki Ships Cars to G.M.". New York times. Retrieved 9 September 2013. The first shipload of 900 fuel-efficient, 60-horsepower cars, called the Cultus, left for the United States from central Japan on Sunday, he said. G.M., which owns 5 percent of Suzuki and helped develop the car, wanted to import up to 100,000 of the cars a year. But because the cars are Japanese-made, they fell under that country's United States import quotas and the government allowed G.M. only 17,000. ^ a b Holusha, John (3 September 1988). "Suzuki Samurai Vehicles Set Record Sales in August". New York Times. Retrieved 9 September 2013. Samurai sales, which had been running at 5,000 to 6,000 a month for the first five months of the year, dipped to 2,199 in June after the Consumers Union report. American Suzuki, which is owned by the Suzuki Motor Company of Japan, heatedly denied the accusation and offered a $2,000 cash incentive to its dealers – a very substantial amount on a vehicle with a base price of $8,495. 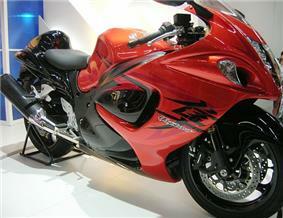 That allowed dealers to cut prices aggressively, and at the same time Suzuki increased its advertising. ^ a b "Suzuki GSX･R750". 240 Landmarks of Japanese Automotive Technology. Society of Automotive Engineers of Japan, Inc. Retrieved 12 September 2013. 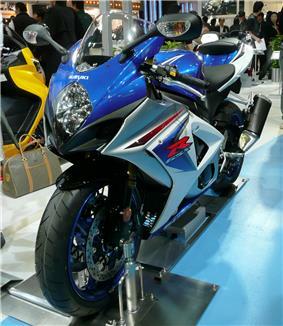 The Suzuki GSX-R750 came onto the market equipped with the styling and mechanisms of endurance-racing motorcycles. Suzuki incorporated into this mass-market vehicle technologies that it had developed through its racing experience, and it became a best-seller in the 750 cc class. ^ a b "Jinan Qingqi Motorcycle Co., Ltd.". About Us. qingqi.com.cn. Retrieved 12 September 2013. JINAN QINGQI MOTORCYCLE CO., LTD.(JNQQ) was established in 1956, the headquarters is in Jinan City, Shandong Province, where the first civil motorcycle of China was made. Since 1985, Jinan QINGQI started to work with SUZUKI (JAPAN) technically, and manufactured the first scooter in mainland of China. Established the Joint Venture with SUZUKI in 1996, with PEUGEOT in 2006, and became the only company who has 2 different technical systems from both Europe and Japan. ^ "G.M., SUZUKI IN CANADA TIE". New York Times. 28 August 1986. Retrieved 12 September 2013. Unlike three other Asian auto plants being built in Canada, the companies said they have agreed to abide by a treaty between the United States and Canada requiring greater Canadian content in cars produced here. ^ Bohlen, Celestine (25 April 1991). "Suzuki Starts Joint Venture In Hungary". New York Times. Retrieved 13 September 2013. The Suzuki Motor Corporation began the first major Japanese investment in Eastern Europe today, signing a joint venture project that will start producing hatchback passenger cars at a former Soviet military base in northern Hungary next year. The $235 million Magyar Suzuki plant, near the Danube River in the city of Esztergom, represents the largest single foreign investment in Hungary. ^ "Suzuki Wagon R". 240 Landmarks of Japanese Automotive Technology. Society of Automotive Engineers of Japan, Inc. Retrieved 12 September 2013. The Wagon R has a short bonnet and a tall body style. Featuring upright seats for ease of ingress and egress, its spacious passenger compartment accommodates 4 adults. It has a fully flat luggage compartment with a generous amount of space. The Wagon R has a highly rigid body and a wide field of vision and demonstrates its environmental consciousness by adopting the new R134a refrigerant. Named the 1993 RJC Car of the Year. ^ Hideko Takayama; George Wehrfritz (17 January 1999). "Japan's Mini Invasion". Newsweek. Retrieved 18 September 2013. 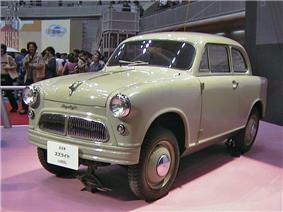 Suzuki called it the Wagon R. Launched in late 1993, Aoshima's creation became Japan's car of the decade. It accommodates four adults and luggage, and has seats that recline, fold flat into a bed or tuck away to maximize storage space. 'It's like a 4.5-tatami room,' marvels one Tokyo-based analyst, referring to the multifunctional spaces in small Japanese homes. Every Japanese minicar maker borrowed the Wagon R concept, and it appeared later in the two Mercedes designs, the A-class and the Smart. ^ Peterson, Iver (23 April 1997). "Suzuki Says Testers Sought To Prove A Car Unsafe". New York Times. Retrieved 9 September 2013. In its comment on roll-over standards, presented to the National Highway Traffic Safety Administration yesterday, the car maker included an affidavit from a former Consumers Union test mechanic that after the car failed to tip after several runs, a senior Consumers Reports editor in effect instructed the testers to find someone who could make the car go up on two wheels. Suzuki said a videotape of the test, obtained from Consumers Union under a court procedure, also reveals a car tester yelling, 'All right, Ricky baby!' when a Samurai driven by Richard Small tipped up in a test. ^ "COMPANY NEWS; AUTO MAKER TO TRIPLE ITS STAKE IN SUZUKI MOTOR". New York Times. 17 September 1998. Retrieved 11 September 2013. G.M. is strong in North America, Latin America and Europe, but it does not have a big presence in Asia. It hopes to use Suzuki as a springboard to increase its presence there. ^ "Changan Automobile Company Limited". Changan Suzuki Automobile Co., Ltd. Chongqing Changan Automobile Company Limited. Retrieved 20 September 2013. Changan Suzuki Automobile Co., Ltd now has 4176 staffs, of which there're about 880 management and technology personnel. Changan Suzuki is mainly engaged in four products series: LingYang (came to market in June 1998); Swift (came to market in April 2005); TianYu SX4 (sedan) (came to market by the end of 2006) and SX4 (hatchback) (came to market in March 2007); new Alto (came to market in September 2009). ^ Miyazaki, Ken (9 March 2012). 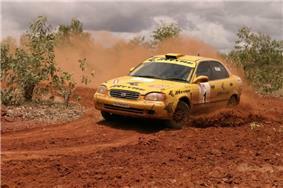 "Suzuki looks to restart business in Myanmar". Asahi Shimbun. Retrieved 20 September 2013. The maker had produced motorcycles and small commercial vehicles in Myanmar under a joint company with a state-backed enterprise since 1998, when the country was ruled by a military government. ^ "Myanmar Suzuki Motor Co., Ltd.". Businessweek.com. Bloomberg L.P. Retrieved 20 September 2013. Myanmar Suzuki Motor Co., Ltd. manufactures motorcycles, small passenger cars, and commercial vehicles. The company was founded in 1998 and is based in Yangon, Myanmar. Myanmar Suzuki Motor Co., Ltd. operates as a subsidiary of Suzuki Motor Corp.
^ a b "Suzuki Hayabusa". 240 Landmarks of Japanese Automotive Technology. Society of Automotive Engineers of Japan, Inc. Retrieved 16 October 2013. 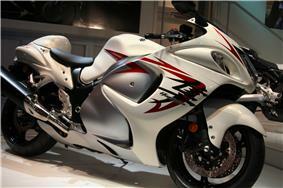 The Suzuki Hayabusa had a 1299 cc 4-cylinder DOHC engine, which employed the latest electronic fuel injection system. High-speed plated cylinders were used for the engine, and excellent piston cooling efficiency was achieved through the use of a compact and lightweight cylinder block and crankshaft. The multi-reflector low beam and projector high beam were characteristically laid out one above the other. Large air intakes to introduce boost pressure were laid out on both sides of the lights in locations that maximize running wind pressure. This contributed to greatly increased horsepower and torque. A large capacity clutch helped to realize fine gear engagement and light clutch feeling. The aerodynamic performance was optimized by an elaborate design around the cowling featuring a one-piece front fender, air intakes, and the like, as well as by optimal layout of the radiator and oil cooler. ^ a b Krebs, Michelle (30 April 2008). "Rick Suzuki: Fall on Sword Justified?". AutoObserver. Edmunds.com. Retrieved 2 October 2013. In a March letter to employees, the 60-year-old Rick Suzuki wrote that he would step down 'to bear responsibility' for the automaker's poor sales and earnings. No timeframe was given for his departure. Chairman of American Suzuki since 1998, he is the grandson of Suzuki Motor Corp. founder Michio Suzuki. ^ Bowman, Bill. "GM Argentina". Generations of GM History. GM Heritage Center. Retrieved 30 September 2013. ^ a b "Suzuki Choinori". 240 Landmarks of Japanese Automotive Technology. Society of Automotive Engineers of Japan, Inc. Retrieved 12 September 2013. 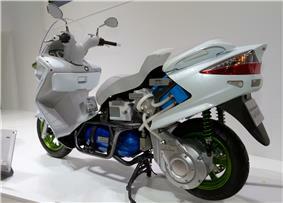 The Suzuki Choinori was developed to be mainly used for short journeys for commuting and shopping. The appropriate engine output, body structure, and required functions were reviewed from the basic design phase in pursuit of mass reduction, rationalization of parts, and high quality. It achieved mass reduction of about 40% compared with a conventional scooter by reducing the size of parts, the application of a new engine, a newly designed frame, and by careful reduction of the number of plastic parts. Such rationalization, including a reduction in the number of parts tightened by nuts and bolts, enabled the Choinori to be sold at the low price of 59,800 yen. Colored resin was used for plastic parts to provide 6 body colors without the need for painting. A new high-speed cylinder plating technology was introduced for the newly developed 4-stroke engine to enable high-speed processing at low cost. This reduced the weight of the engine by about 40% compared with a conventional 50 cc engine. ^ Manufacturer with Opening of Georgia ATV Plant""Suzuki Becomes a ``Made-in-America . The Auto Channel. 31 May 2002. Retrieved 2 October 2013. 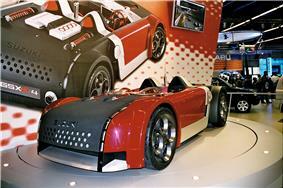 ^ a b "75th Geneva International Motor Show". Global Suzuki News. Suzuki Motor Company. 1 March 2005. Retrieved 10 September 2013. This year's show sees the European launch of the New SWIFT, which was previously premiered at the Paris Motor Show in 2004... We also introduce our recently established brand philosophy 'Way of Life!' which is to put further emphasis on our customers and their individual ways of life with our products. It is also to show, with this phrase, our devotion to creating cars that will bring true customer satisfaction. ^ "Press Release". Global Suzuki. Suzuki Motor Company. 1 March 2005. Retrieved 10 September 2013. The 2005 Geneva Motor Show presents the ideal opportunity to introduce both our new Swift compact, as well as our fresh new brand philosophy, which wefve chosen to call 'Way of Life!' Like all our products, the Swift has been designed to deliver a driving experience with genuine worldwide appeal. ^ "Suzuki Cycles". Français. Suzuki Canada Inc. Retrieved 11 September 2013. ^ "第26回　日本カー・オブ・ザ・イヤー　2005–2006". COTY記録. CAR OF THE YEAR JAPAN. Retrieved 10 September 2013. ^ "Suzuki XL7 CUV to Bow in N.Y.". WardsAuto. Penton. 29 March 2006. Retrieved 30 September 2013. The XL7 is based on General Motors Corp.'s Theta platform (Chevrolet Equinox, Saturn Vue, Pontiac Torrent). The XL7 will be built at Suzuki's CAMI Automotive Inc. joint venture with GM in Ingersoll, Ont., Canada, which last built a Suzuki vehicle in January 2004. CAMI also produces the Equinox and Torrent. ^ Amadon, Ron (14 October 2006). 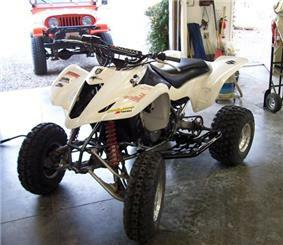 "2007 Suzuki XL7 Limited". MarketWatch. Retrieved 30 September 2013. Suzuki still has a long way to go to become a household word as far as four-wheel vehicles go, but they're now better prepared to take on the big dogs with vehicles like the XL7. The trick is to get customers into their showrooms (and, as a corollary, for potential customers to find those dealers). 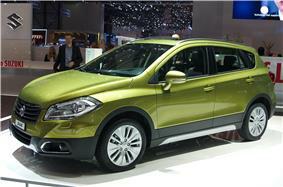 ^ "Volkswagen and Suzuki agreed to establish a comprehensive partnership". Volkswagenag.com. 9 December 2009. Retrieved 5 October 2010. ^ Hiroko Tabuchi; Bettina Wassener; Chris V. Nicholson (9 December 2009). "Volkswagen to Buy 20 Percent Stake in Suzuki". New York Times. Retrieved 2 October 2013. In the deal, which is subject to regulatory approval and is expected to close in January, Volkswagen will purchase 19.9 percent of Suzuki's issued shares for ¥222.5 billion, or $2.5 billion. Suzuki will invest up to half of that amount received from Volkswagen into shares of Volkswagen. ^ "Suzuki eyes RI as production hub with $800 million project". Kontan.co.id. 22 June 2011. Retrieved 19 August 2011. 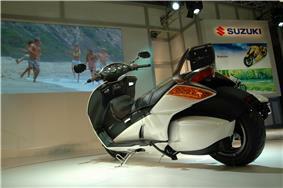 ^ "Suzuki s Rome plant celebrates 10th anniversary". Rome News-Tribune. 26 February 2011. Retrieved 2 October 2013. Rod Lopusnak, U.S. sales manager, told the plant workers that of the 311,537 four-wheelers manufactured at the Rome plant, more than 260,000 have been sold in the U.S. 'The last two years have been very difficult on Suzuki and the whole U.S. economy, but the power sports business in general has been challenged like never before,' Lopusnak said. ^ "Suzuki To Increase Presence in Indonesia". Wall Street Journal. 4 January 2012. Retrieved 3 October 2013. For Suzuki, the new Indonesia plant is part of a campaign to expand rapidly in Asian markets outside Japan, and to solidify its lead in India. While the company remains committed to its home market, sluggish demand and intense competition there have led it—and most other Japanese auto makers—to seek growth abroad. The yen's rise to record highs against the dollar has made exports from Japan less competitive, so the makers are ramping up production elsewhere. ^ a b Wilson, Andrea (17 August 2013). "2014 Suzuki GSX-R 1000 SE First Look". Cycle News. Retrieved 23 August 2013. The 50th anniversary Suzuki GSX-R1000 was launched in front of the media and Suzuki owners in the Suzuki hospitality today at Indianapolis Motor Speedway. ^ Keenan, Greg (26 March 2013). "Suzuki calls off 30-year drive in Canada". Auto Making (The Globe And Mail). The revenue from selling about 5,500 vehicles, as Suzuki did in Canada last year, do not come close to covering the costs of designing and developing vehicles for a market this size, along with meeting regulatory requirements that are different than those of the company's other large markets such as Japan and India. ^ Press Release (1 April 2013). "American Suzuki Motor Corporation ("ASMC") Consummated Chapter 11 Plan and Sale of Assets to Suzuki Motor of America, Inc.". Business Wire. Retrieved 17 October 2013. ASMC's Chapter 11 Plan was confirmed by Bankruptcy Judge Scott C. Clarkson of the U.S. Bankruptcy Court for the Central District of California in Santa Ana on 28 February 2013. The Chapter 11 Plan became effective on 31 March 2013, when ASMC closed its assets sale and commenced paying the claims in full of all consensually settling Automotive Dealers and trade creditors through the PE Creditor Trust established by the Plan. ^ Jensen, Christopher (23 October 2013). "Nissan and Suzuki Issue Recalls for Braking Problems". New York Times. Retrieved 24 October 2013. The motorcycle manufacturer says corrosion of the front brake piston may generate gas within the brake system, reducing stopping power. There was no mention of any accidents related to the problem. ^ "Maruti Suzuki Monthly Sales". Marutisuzuki.com. Retrieved 29 December 2012. ^ "Maruti Suzuki XA Alpha Price, Photos, Reviews". CarTrade.com. Retrieved 17 April 2013. ^ "Maruti Suzuki XA Alpha origins – Overdrive". Overdrive.in. 15 March 2011. Retrieved 17 April 2013. ^ "Concept XA Alpha unveiled". Marutisuzuki.com. 5 January 2012. Retrieved 17 April 2013. ^ a b Thomas, David (5 November 2012). "Suzuki Files Bankruptcy, Stops Selling Cars in U.S.". Cars.com. Retrieved 5 November 2012. ^ Matrix Consultants, 323.766.0732. "Suzuki December 2008 Sales". Media.suzuki.com. Retrieved 19 April 2011. ^ Jeremy W. Peters (11 January 2005). "That's a Suzuki?". New York Times. Retrieved 30 October 2013. 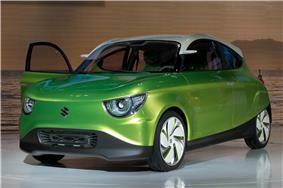 Suzuki says a derivative of the Concept-X will be built sometime in 2006. By then, the steering wheel, which resembles one you would see on a jet, will most likely be cut from the plan. 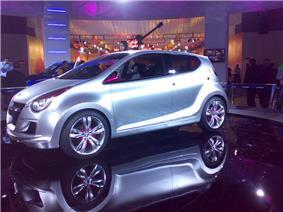 ^ "Suzuki iK-2 premium hatchback unveiled". 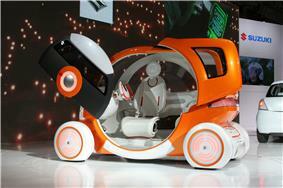 ^ "Suzuki iM-4 compact SUV concept unveiled at 2015 Geneva Motor Show". ^ "karimun wagon r". Karimun Wagon R. Retrieved 11 July 2009. ^ Weeston, J. (11 February 2013). "Top Ten Worst Motorcycles of All Time". Xmotorcycle. Helmet Venture Inc. Retrieved 7 October 2013. Imagine having an amazing amount of horsepower you could turn on instantly like a light switch. Now, imagine never quite knowing when that light switch is going to suddenly flick on and accelerate you forward to the point of making the Kessle Run in less than 12 parsecs. Also, you're off-road and it's 1971. ^ Weisel, Jody. "The Worst Bikes I Ever Rode". Motocross Action Magazine. Hi-Torque Publications, Inc. Retrieved 7 October 2013. It would scare you. I loved the Suzuki TM125 Challenger and felt that the TM250 Champion was a decent bike, but the TM400 Cyclone was totally unpredictable. I take that back. If you expected bad things to happen, it never disappointed you. Once, at a night race on a '74 model, I thought someone was trying to pass me on my left side; it turns out that the back of my TM400 was swapping so bad that I could see it in my peripheral vision. Down a rough straight, the TM400 resembled a fish flopping on a beach. ^ "1975 Suzuki RM 125". Pelican Guano Motorsports. Retrieved 11 October 2013. The '75 was the first year for the RM series. It actually was only made for 6 months as the TM was in production at the beginning of the year and at the year end Suzuki introduced the new RM series. ^ "The Life And Times Of The Suzuki RM250". Dirt Bike Magazine. Hi-Torque Publications, Inc. 12 December 2011. Retrieved 11 October 2013. The liquid-cooled RM250 of 1982 reigns supreme as the best 250 of the year. It's faster, lighter and has better suspension than anything in the class. ^ "1982 Suzuki GS1000SV Katana". 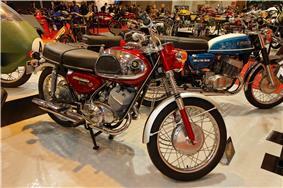 Classic Bikes from the AMA Motorcycle Hall of Fame Museum. American Motorcyclist Association. Retrieved 16 October 2013. ^ McCraw, Jim (20 July 1997). "Motorcycle Wars: Japan's Latest Shots at Fortress Harley". New York Times. Retrieved 13 October 2013. When Japanese clones began to arrive in the United States in the late 1980's – Suzuki's Intruder was the first – Harley was incensed that Honda had managed to duplicate its engines' distinctive sound, a result of Harley's simple crankshaft layout. Harley has applied for a trademark on the sound, a potato-potato-potato rhythm at idle and a staccato beat at cruising speeds. ^ "Products History 1990s". Global Suzuki. Suzuki Motor Corporation. Retrieved 2 September 2013. ^ a b "History". All New V-Strom 1000 ABS. Suzuki Motor Corporation. Retrieved 15 October 2013. ^ Bennett, Jon (13 January 2009). "Suzuki DL1000 GT". Bristol Post. Retrieved 16 October 2013. A couple of days later, however, I was in for a surprise. Having made a conscious decision to go out thrill-seeking, rather than just using the DL to commute, the smooth 1,000cc V-twin began to show its heritage. Based heavily on the tried and tested motor which once powered the frankly lunatic TL1000S and TL1000R sportsbikes of the 90s, the V-Strom showed remarkable venom once the revs really began to climb. The 90-degree V-twin which had previously been so gentlemanly had transformed into a fire-breathing monster. From 5,000rpm up to the redline, in gear after gear, the V-Strom has plenty of shove for the most brisk of overtaking manouevres. ^ Carpenter, Susan (12 December 2007). "Suzuki B-King is for Lord Vader. His chariot awaits.". Los Angeles Times. Retrieved 25 October 2013. From the front end, the headlight looks like the face of a Hasbro robot. The turn signals blink from the outer edges of the tank. Travel down the bike's body to its curved radiator and finned oil cooler, and you're looking at what appears to be the Dark Knight's voice box. ^ Welsh, Jonathan (24 September 2008). "Suzuki's B-King Muscle Bike Is for Motorcycle Riders Who Want to be Noticed". Wall Street Journal. Retrieved 25 October 2013. Viewed up close it looks, well, scary. If the B-King appeared in a feature film, the villain would ride it. Had 'Star Wars' been a biker movie, Darth Vader would have been in his element astride this Suzuki. The bike is menacing in black and has a mask-like shield around its headlight. Its pointy stinger tail and overall angular styling would go well with a cape. ^ a b "Products History 2000s". Global Suzuki. Suzuki Motor Corporation. Retrieved 25 October 2013. ^ "1976 Suzuki RE5 Rotary". Classic Bikes from the AMA Motorcycle Hall of Fame Museum. American Motorcyclist Association. Retrieved 8 October 2013. To Suzuki's credit, the high-tech RE5 worked fairly well. But all that complexity resulted in a hefty curb weight of 573 pounds. That bulk, coupled with the rotary's large appetite for fuel, resulted in gas mileage in the 30 to 35 mile-per-gallon range at a time when Americans were facing gas crises. And the bike's limited cruising range didn't endear it to the touring market it was designed for. ^ The future' 25 years on"'". Visordown. Immediate Media Company. 22 March 2012. Retrieved 27 October 2013. The wonder of the internet means documents that once could only have been found by rooting through reams of hidden paperwork or scrolling endless microfilm rolls are available to anyone who cares to look. But as far as we know no publication has ever revealed these images showing the secrets of the most advanced motorcycle of the 1980s. ^ Burns, John (11 May 2012). "Days of Future Past". Cycle World. Bonnier Corp. p. 2. Retrieved 27 October 2013. Suzuki sold a few, mostly to owners who must've parked the things under a cover once the honeymoon was over and reality set in. You really don't see many B-Kings running around, do you? It's destined to be a serious Craigslist bargain in another few years when owners throw in the towel after admitting that fashion is never going to catch up to this motorcycle. ^ Burns, John (11 May 2012). "Days of Future Past". Cycle World. Bonnier Corp. p. 2. Retrieved 28 October 2013. Suzuki sold a few, mostly to owners who must've parked the things under a cover once the honeymoon was over and reality set in. You really don't see many B-Kings running around, do you? It's destined to be a serious Craigslist bargain in another few years when owners throw in the towel after admitting that fashion is never going to catch up to this motorcycle. ^ a b Burns, John (11 May 2012). "Days of Future Past". Cycle World. Bonnier Corp. p. 3. Retrieved 28 October 2013. What the G-Strider did get right was its 'nextgeneration telematics system, with interactive communications over a bidirectional wireless infrastructure...all controlled via glove-friendly trackball.' Which is actually similar to the thumbdrive controller that sorts through all the electronics on BMW's new K1600s. This wouldn't be the first time BMW took some good cues from the generally proletarian Suzuki. [...] In 2007, Suzuki went so far as to announce that the Strat would be entering production at an unspecified future time. Shortly thereafter, as you may have noticed, the free-market system imploded, and our Suzuki contacts claim to have no knowledge of what became of the bike. ^ "Suzuki Biplane Concept – First Look". Cycle World. Bonnier Corp. Retrieved 28 October 2013. This is the Suzuki Biplane, penned at Suzuki's recently re-opened U.S. design center. Suzuki's goal was to give the rider the sensation of flying in a vintage biplane with no canopy, a distilled, in-the-wind riding experience. It (conceptually) uses a V-Four motor, with cylinder heads and exhaust headers visible on the sides, just like the fabric-skinned twin-wingers of the last century. The front end gets a girder fork (kinda like the Confederate Wraith) and rim-mounted brake discs (a la Buell XB). The exhaust is tucked in underneath the cowling, and the link-type rear suspension can be seen under the tractor-style seat. ^ a b Garrett, Jerry (29 October 2007). 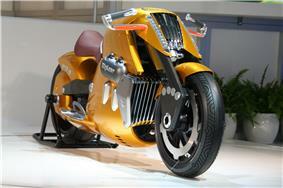 "Tokyo Motor Show: Two-Wheel Thunderdome". New York Times. Retrieved 28 October 2013. The Suzukis are wild. Silent runner: the Crosscage is a fuel cell bike that really works; no gas engine at all. The powerplant is made by Intelligent Energy of the U.K., the same group that made the ENV fuel cell bike I tested — and thought was viable even if it sounded like a U.F.O., not a bike. The Biplane supposedly has a V-4, but the show bike is most likely a make-believe mockup. Looks to be straight out of a video game. When will either Suzuki be produced? Right after the 12th of Never. Note: Suzuki left the U.S. auto market in 2012 and Canada in 2013. It remains in Mexico.